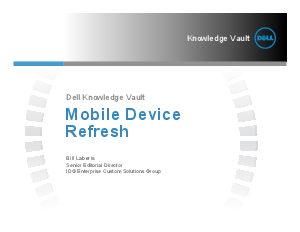 Research Library > Dell Mobility > What's Driving Mobile Device Refresh Rates? In addition to refreshing workstations and servers, IT pros must now also plan lifecycle refreshes for laptops, tablets, smartphones and other mobile devices. From increased productivity to compliance to support costs, discover what factors are driving those decisions. Also, download this report and learn which mobile initiatives IT organizations are investing in most aggressively.